New Orleans, Louisiana–famous for good food and good culture–is home to Langenstein’s, a fifth-generation owned and operated business proudly serving customers in the area for over 90 years. Established in 1922 by Michael Langenstein and his sons George and Richard, the goal was to carry the best meat and seafood in New Orleans. The business has held firm to its original ideas, while continually adapting to the needs and suggestions of their loyal customers. Langenstein’s continues to operate by the saying “everything can be customized”. If a customer wants a gourmet item that was not available in New Orleans, Langenstein’s will do its best to stock them. Langenstein’s serves their customers with high-quality service and products. Since its humble beginning, the grocery store has grown to become one of the most beautiful markets in New Orleans. To better serve their customers, Trey Lanaux, a fifth-generation owner, and operator of Langenstein’s and great-great-grandchild of Michael Langenstein decided to build a third location in River Ridge. Decorworx was hired on to create the décor for the new site which would be completely customized, mainly reflecting the store’s “everything can be customized” saying. To attract the potential customer base from the area, upper-middle class and young families, a classic, yet fresh style chosen as the basis for the store’s décor. The décor based around a modern and mainstream theme which gave the nod to the 1900’s, creating a charming look that would appeal to local customers. A color palette established deep, rich jewel tones and neutrals which helped reflect the culture of the surrounding area. Vintage styled brick, wood, and various other textures were used throughout the store to add visual interest. Hand-painted typography and illustrations were created to emphasize the customization philosophy that Langenstein’s operates. The overall design of the store felt comfortable and welcoming and had a unique and vintage, yet modern style giving the store a competitive edge. 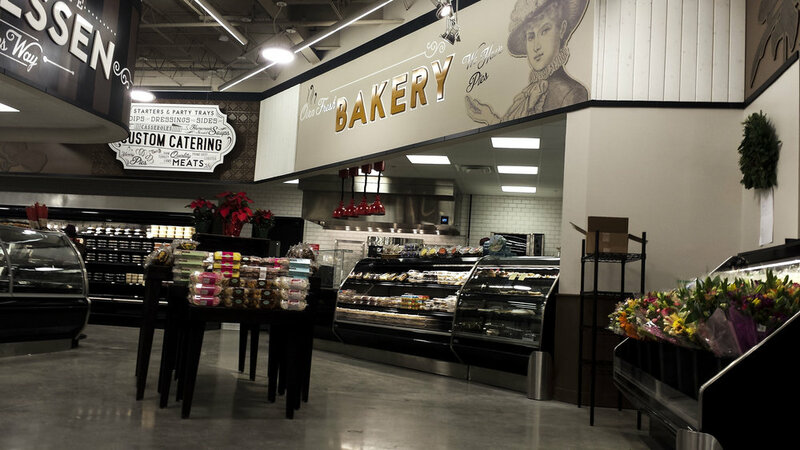 The new store was the perfect addition to help Langenstein’s serve their customers better. Langenstein’s has been a historical treasure in the New Orleans area for over 90 years, and the new store allows the family to further their dedication to serving the area.